Last night, Facebook announced sixty new applications from Open Graph partners, and one of them was the commerce app sneakpeeq, which we’ve covered here on The Next Web before. Sneakpeeq is a social buying site that lets its users check out the merchandise before taking a peak at the price tag, much like you would do in a store. As of November, the site had seen 30% growth since launching, and with its new “action” item on Open Graph, those numbers could skyrocket. 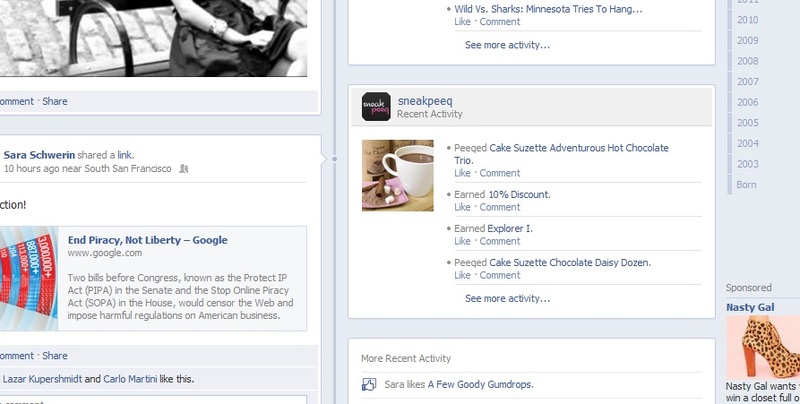 With Open Graph, developers are able to auto-post items to your Timeline with an action phrase, and sneakpeeq’s action item is “peeq”, fittingly. What Open Graph does for sites like sneakpeeq is allow them to provide more than just a boring link on someone’s wall. With Timeline integration, brands are getting a prominent space on the right hand side of a users Facebook presence, complete with the action that they took on the site. It gives context to the things that we share on Facebook, which until now has been sorely lacking. Clicking “view” on the item brings up a window that shows a brief description and picture of what your friend “loved” on sneakpeeq. This is just one example of how Facebook could turn into an e-commerce platform giant overnight. By letting you see what your friends are browsing in real-time, sales could be made on the spot for a company like sneakpeeq and its long list of top-notch designers. Since sneakpeeq also lets you earn badges for your activity on the app, those activities will also show up in the ticker, letting people know what you’re up to and enticing them to join the site at the same time. The thing that I like about Open Graph is that it brings context to all of the social things your friends are doing. In the same way that foursquare lets you know where your friends are at any given time, Open Graph lets you know what they’re actually doing, be it reading a story, watching a movie, listening to a song, or of course taking a “peeq” at the price of a piece of jewelry or clothing. 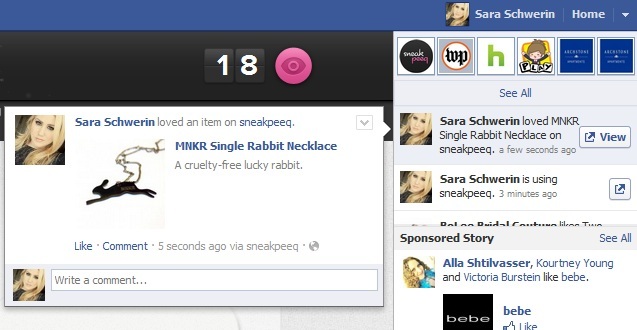 Social shopping is going to be big this year and sneakpeeq is at the forefront of it in my opinion. I have to believe that Amazon is watching all of this very closely, as simply telling me what others have purchased along with an item I’m interested in just isn’t cutting it anymore.